Visitors to the farm are usually surprised to learn that we water the entire garden and landscape with only the water from our rain water collection system. 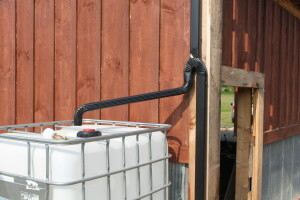 Our system, which collects and stores rainwater from our barn’s metal roof, provides 100% of our annual watering needs. The best part, it was extremely easy to install, and can be inexpensively adapted to almost any home, shed or roof with a gutter. It gives us access to free water, and with our two plastic tote tanks, can collect as much as 550 gallons from a single downpour. And that’s only using rain from the back portion of the roof! This spring, we will add a third tank fed by the front gutter – increasing our storage to just shy of 900 total gallons – enough to handle our watering needs for nearly two months of complete drought. 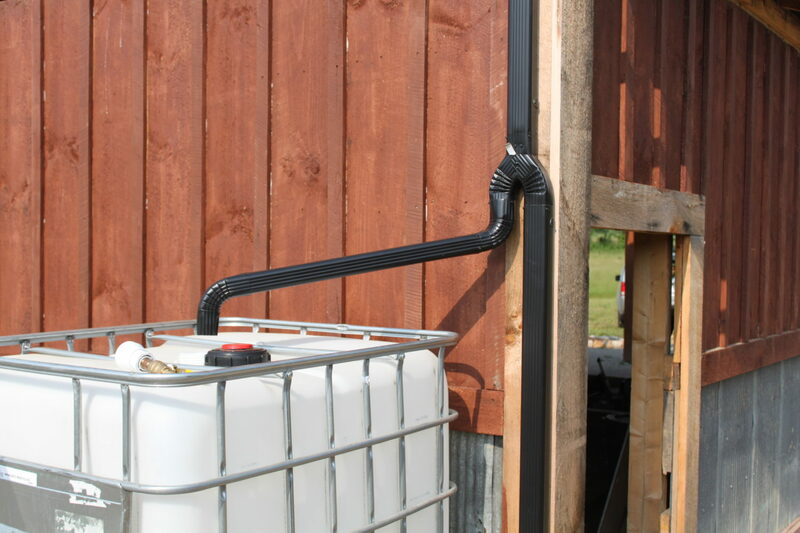 The system collects rain water from a simple adapter made to fit our existing barn’s gutter. 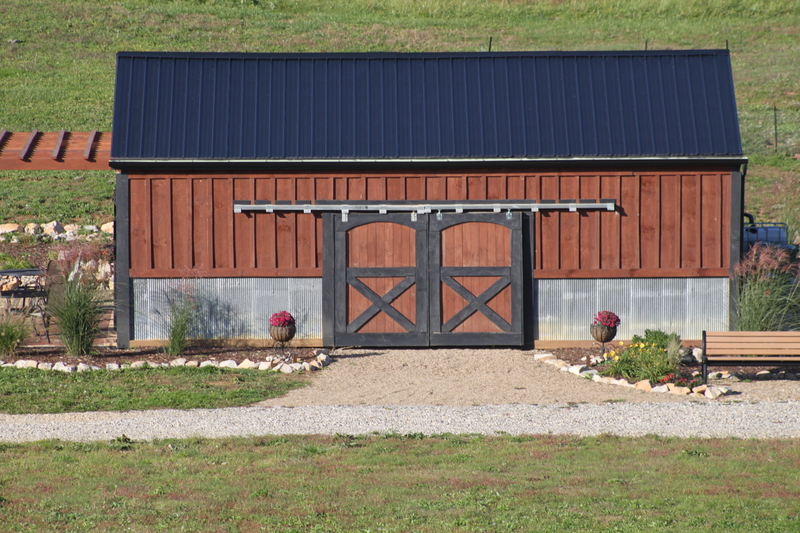 The barn has a standard gabled metal roof measuring 13 wide’ x 32′ long on each side. A 32′ section of guttering runs along the bottom of each side of the metal roof, slanted slightly to carry all of the water to the eastern side of the barn. From there, both sides empty into standard downspouts. 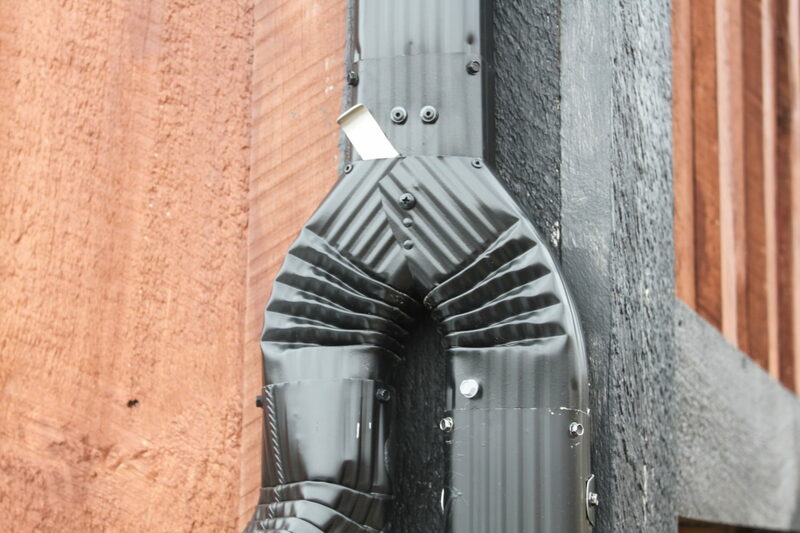 The front downspout (not used currently), runs down and out to the field for normal drainage. 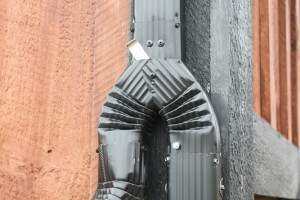 On the back downspout however, we installed a simple 2-way in-line diverter (See Picture). When the metal lever is slid to the left, rain water is diverted into a 275 gallon storage tank located below the downspout. When all tanks are full, the switch can be slid back for normal drainage. From the main storage tank, we pump and fill a second 275 gallon tank installed above our garden. With that, we can water all of our plants quickly, using gravity and a standard garden hose connected to the tank. To increase capacity and mobility, we are adding a second diverter to the front gutter this year. That will fill a 3rd tank mounted on wheels – giving us the ability to pull water anywhere it’s needed with our tractor. That will be a huge time saver when it comes time to water the newly planted grapevines and fruit trees on the hill this year. Totes: $40 each We found ours for $40 each after searching on Craigslist. You can also check with local food plants that may receive their raw materials in them. 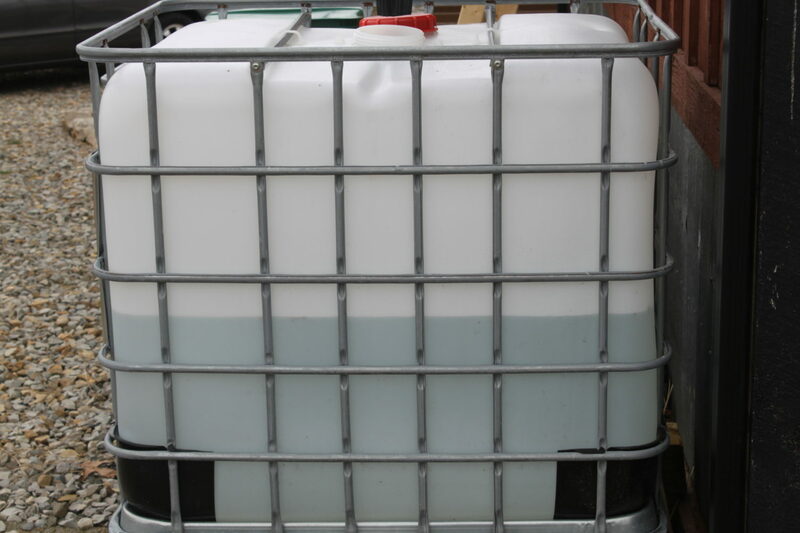 One word of caution – make sure you know what was originally in your tanks and that it is safe. Our tanks were used to hold maple syrup and molasses – simple food products that can be cleaned out and re-used. 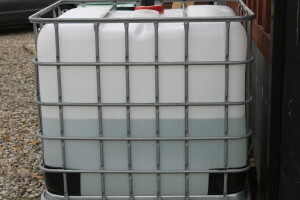 You will want to avoid using tanks that held harsh chemicals. Most tanks come with a 6″ threaded cap on top, and a 2″ threaded outlet valve at the bottom. You can convert the bottom 2″ valve to accept a standard garden hose with a few adapters found at your local hardware store. Diverter Switch : $15 You can find standard gutter diverters at your local home improvement store for about $15 – they install in minutes with rivets or screws. 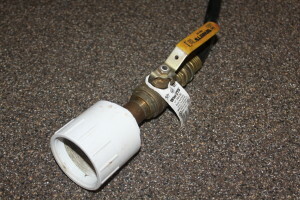 Threaded Valve and Hose Adapter: $15 Your local plumbing or hardware store can hook you up with a simple threaded connection valve to convert the 2″ drain at the bottom of your tank to handle a regular garden hose. We also installed a ball valve ($10) on our tank for an extra shut off point. Keep It Dark: You will want to keep the water from getting direct sunlight to keep algae from growing in the stagnant water. Algae can only grow if there is light. If your tank is translucent like ours, you will want to cover it. We use a black covering like a grill cover to cover them up once the sun and algae become a problem. Not only does it dress it up, but it keeps the water and the flow line crystal clear. For the pictures here, we have the covers off to show the tanks. Keep It Covered: No matter what system you use to store your water, you will want to keep closed. Water that sits is an open invitation to mosquito larvae . Our totes came with 6″ caps and lids on the top. We simply cut out the hole for the downspout, and then sealed the edge with some inexpensive foam. Know What To Use The Water For: We only use our reclaimed water for watering plants or washing off equipment ,etc. Since we do not treat it in any way, we do not use it for drinking. Check to make sure your allowed to collect rain water. Although it sounds crazy, in some states out west you are not allowed to collect rain water, as the water rights still belong to the state. So to be on the safe side, check with your local or state government to make sure it’s legal where you live.